For the last several weeks we've been reviewing a Digital Unit Study focused around the book Heroes of History - Milton Hershey from YWAM Publishing. Not only is this a great biographical novel, but with the added unit study and a special trip to Hershey, PA, history came alive for Sebastian in a way I couldn't do on my own. YWAM Publishing creates materials that highlight the virtues of Christian role models in our world. By highlighting evangelism, prayer, discipleship, and mercy ministries, YWAM Publishing's books encourage us to help the needy in the world with the gifts that God has granted each of us. The book, along with the unit study, is almost a complete curriculum. You could easily take a month and work on just this topic and add in some math and music to round out your homeschool. The book is a full novel with a compelling story line. It does a great job explaining the feelings of Milton Hershey which helps the student delve into the story and learn along with Mr. Hershey. 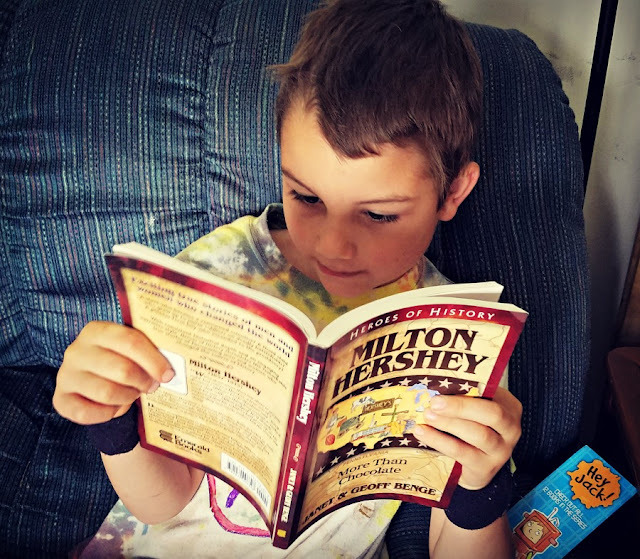 The book goes through the life of Milton Hershey and highlights his how he never gave up. Although he had a few failed business attempts, he persevered eventually created the Hershey Chocolate Company. Not only did he gain success, he became a philanthropist and changed the town of Derry Church into a community that had music, arts, gardens, a great medical facility, and more. There is no wonder they changed the name of the town to Hershey because he built the town! The book was written in a way that Sebastian could easily read. It is probably about a fourth grade reading level but would make a great read aloud. Sebastian typically read a chapter or two on his wn and then we would do some of the activities suggested in the unit study. The unit study is jam packed with activities to pick from. We couldn't do all the activities because there were too many, but there are enough options to cater to any child and any homeschool. Some of the activities in the study guide included social studies and map skills, audio and visual projects including fun arts and crafts, research and essay writing ideas, hands on activities, as well as comprehension questions for each chapter. Lucky for me, there is an answer key to the questions in the back. There are even some printable worksheets to be used in the unit study! There really wasn't anything we didn't like! Who would this be a good fit for?